This item was handmade in India in a workshop sponsored by Noah’s Ark, an NGO that offers funding for raw materials, machines and workshop repairs to 100 artisan groups across India. In exchange for assistance, workshops must prove that all employees are paid fair wages for their products and work in safe and clean conditions. Noah's Ark also offers free classes in capacity building to its network of 600 artisans, a rigorous quality control check, and runs education and water sanitation projects to benefit the artisans’ children and the rest of the community. The company has established 20 new workshops in the past 15 years, and all employees are paid 10-15% above the local rate. Noah’s Ark was founded by Mr. Samuel Masih in 1986 back before anyone was familiar with the concept of “Fair Trade.” A businessman from Moradabad, India, Masih observed his other business associates were taking a personal commission from the local metalworking artisans, on top of paying them very low wages for their work. This led to a distrustful and exploitative work environment, and inspired Masih to create a more collaborative environment based on trust and mutual respect. After two difficult years, Samuel explained his objectives to Mrs. Sullivan of Sullivan Florist in the United States, who immediately placed an order for US$ 70,000. This led to collaborations with other international companies, including Tear Fund, Artisanat-SEL, Goed Werk, TEAM and Oxfam Australia. Today, the company produces a US $1.5 million in exports and funds Noah's handicrafts and Welfare society, an artisan association created in 2000 to promote artisan welfare, capacity building, childhood education and social work. 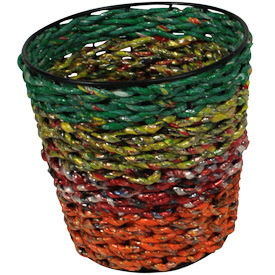 These eco-friendly planters are made from recycled candy-wrappers. Several candy wrappers are twisted together into a rope and wound around a recycled metal frame. A conscious effort to reduce and reuse discarded wrappers. 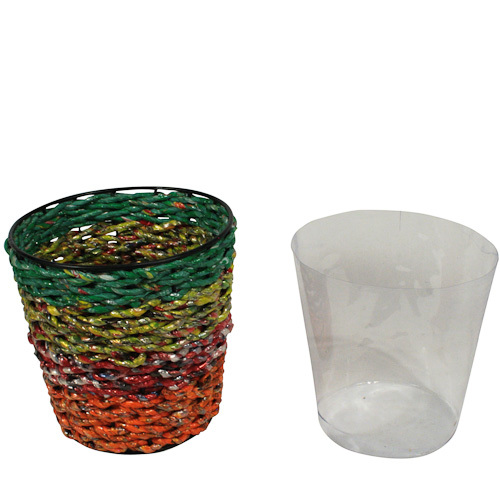 Take a step forward and be a responsible earth dweller with these planters. Handmade using recycled materials by artisans at Noah's Ark. Noah's Ark is an NGO founded in 1986 by Samuel Masih, one of the leaders to introduce the concept of fair trade in India, while working with several artisans, Noah's Ark also supports the artisans and their communities with many welfare projects.